Oxfam in Louth is taking the plunge and going plastic bag free "as soon as our current supplies run out", says shop manager Louise Rowley. This move is being rolled out across Oxfam shops nationwide in an attempt to persuade people to avoid the wasteful use of plastic bags. Pictured from left to right are volunteers Zari Vincent and Claire Ollard, and manager Louise Rowley. They are modelling some of Oxfam's range of sustainable alternative bags, made from a variety of materials such as recycled plastic and FairTrade cotton. Known as the "Good Buy" campaign, Oxfam will in future be encouraging their customers to bring their own bags, or to buy one of their re-usable ones. Plastic carrier bags will only be available for a suggested donation of 5p each, with the savings going towards their work on ending poverty. 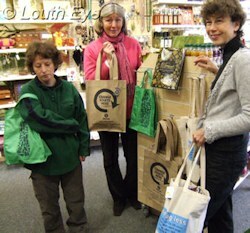 Oxfam is following the example of the traders in Modbury, South Devon, who in May 2007 became the first town in Britain to go entirely plastic bag free. This was prompted by the work of Rebecca Hosking, a wildlife camerawoman who was filming marine life in Hawaii when she was distressed to discover the negative impact plastic waste was having on the animals. She decided to do something about it, and her action is catching on around the country. Message in the Waves documents some of the problems that waste plastic causes for sea life. This includes animals mistaking plastic bags for jellyfish and swallowing them, sometimes with fatal consequences. "Endocrine disruptors enter the air or water as a byproduct of many chemical and manufacturing processes and when plastics and other materials are burned. Further, studies have found that endocrine disruptors can leach out of plastics"
This means that plastics in our environment may pose a risk to human and animal health, so the fewer plastic bags in use the better. The Wholefood Co-op in Little Eastgate follows a similar policy, selling two types of reusable shopping bag and handing out recycled plastic carrier bags instead of buying in new ones. However, according to shopkeeper and local councillor John Hough they currently have no plans to charge for these disposable carriers. Biscathorpe Oil Exploration: A Fracking Foothold? Egdon Resources submits an application for an exploratory well at Biscathorpe. Is it the thin end of the wedge? The town council deliberate over green issues, skate park noise, and plans for houses on flood-prone land. Plans are unveiled for increasing biodiversity at the cemetery, and refurbishing and improving Louth's cattle market on a large scale. The council discuss flood alleviation, and an application to hack down trees bordering the cemetery.